As I mentioned in my last article, I find it very hard to say “no” at work. I also have a problem admitting when I have a problem. A bit of a control freak, I often feel I can handle it all. This is not possible. I can’t do it all – no one can. I find one of the best strategies for juggling projects is to set the right expectations. If you feel you’re going to run past a deadline, or you encounter an issue, talk to someone. Report to a manager and let them know that you’re having problems with a project, client, etc. If you don’t report accurately, you’ll have no one to blame but yourself if you come up short. Just as you should report any issues, it is also your responsibility to ask for help. Call in favors or ask coworkers who aren’t as swamped for assistance on tasks you simply cannot complete. When you do this, be sure to create explicit, easy-to-follow instructions. Someone is helping you out – they shouldn’t have to jump though hoops to help get your work done. If all goes well, you should be able to complete the project more efficiently. Don’t forget to repay the favor if someone asks you when they are in a jam! I am fairly certain that “prioritize” is my least favorite word in the English language. You see, prioritizing three or four tasks is no big deal. The problem arises when these three or four tasks become eleven, twelve or more. Despite my hatred for the word, prioritizing is something I must do everyday (often, more than once each day) in order to keep up. If you are unsure about your priorities, ask a manager to help you decide which work must be done first. Schedule. Now there’s a word I actually love! Every day, I create a list of all the things I will need to do, along with an estimate of the time each task will take to complete. From there, I decide the top three priorities and set my goal to complete those tasks that day. Of course, a typical day almost never goes uninterrupted. I often encounter what I call “side-tasks”. Side tasks are unscheduled projects/tasks/issues that you’ll need to deal with at a moment’s notice. Some take minutes, others can take hours, but none of them help me work toward my goal of finishing my priority work. So what have I decided to do? I schedule these unexpected tasks. Nope. Totally possible. 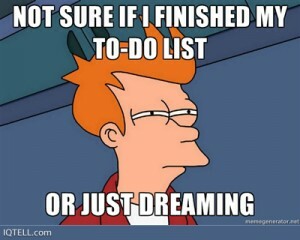 Everyday, I allocate 90 minutes to these side-tasks. I know what you’re thinking – 90 minutes may seem a bit extreme to allocate to these unexpected tasks. I disagree. For the past few weeks, I’ve taken notes each time I’ve been interrupted with a side-task and tracked time on it. It averages out to be about 90 minutes each day. By scheduling 90 minutes for these loose ends, I am able to expect the unexpected, and stress a little bit less. The best aspect of this concept is that if by some miracle my day goes uninterrupted, or if I finish these tasks in less than 90 minutes, I get the time back and can devote it to my priority work. Of course, in all my efforts to expect the unexpected, there will always be times that I encounter unavoidable issues, and must push other projects out of the way to work on them. When these instances happen, I go into recluse-mode. I turn off my office chat, close my email, put my cell phone away, unplug my office phone, and put my headphones on. All of these actions I take should be taken as signals to my coworkers. If I seem unusually difficult to reach, there is a reason for it. All joking aside though, it is absolutely crucial that we learn to respect each other’s time. We are all so busy, with new things being thrown at us on a daily basis, that the last thing we need is to encounter an obstacle within the office. I am trying to live my life with this in mind. Whenever I find myself getting overwhelmed, I try to remember that I am just one person and that I need to sit down, relax and focus on one step at a time. Of course, this is easier said than done, but I truly believe it has helped me a bit. I have a very strict policy about bringing work home. I do my absolute best to avoid it. I do not bring client work home unless it is absolutely necessary. I do, however, spend my weekends reading, researching and practicing new techniques. Sometimes I even write my articles from home, or in the backseat while I carpool to work – like this one for example. Obviously, an article like this isn’t going to change anyone’s life (but if it does, let me know in the comments below, haha). But I digress. The reason I devote my own time to research is because I am very passionate about my craft, and when I make a commitment, I do my absolute best to follow through with it. Every study I’ve read has reported that breaks throughout the workday help create happier, more productive employees. Take five minutes, walk outside, take a few deep breaths and stretch your legs. You’re working hard in there, it’s the least you can do for yourself. Remember, you’re not alone out there. We all feel a bit overwhelmed from time to time – some more often than others. By following a few of these steps, I have found that my life is a bit less stressful and I hope yours will be as well. Looking for a designer who is 100% dedicated to her craft? Contact Optimum7 for a free consultation today.